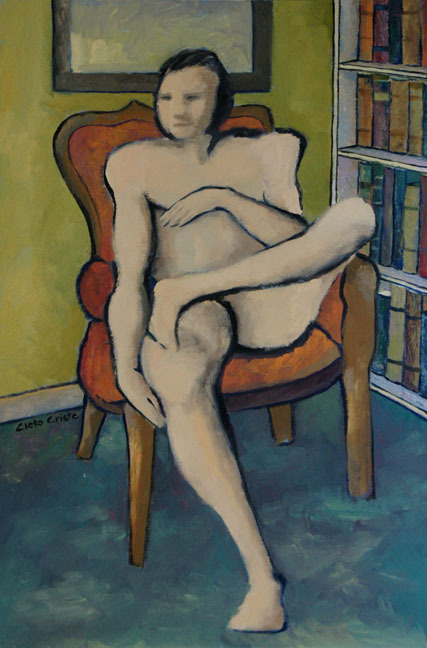 New oil painting – The Reading Room. There’s a small area at the top of the stairs on the second floor of our house that I use as my library. It’s a little bit messy right now with books piling up and hardly enough room to put additional books on my custom built book shelf. I’m an avid reader and I’m constantly buying books. There are books on the shelf that I bought from an annual book sale several years ago that I’ve yet to read. That’s not me on the painting by the way. I used a figure from one of my ink sketches at the life drawing workshop. It was a perfect pose and sketch for this painting and I’m glad I got to use it. The size of this painting is 24″w x 36″h.